It’s a dirty topic, but someone has to talk about it: Odor control for your RV holding tanks. Designed specifically for RV holding tanks, these strong formulas ensure safe, powerful odor control. Available in convenient easy-to-use forms, these products give you maximum performance with minimum effort.Most Powerful Odor Control. Liquefies Waste And Breaks Down Tissue Fast To Prevent Clogging.Powerful Detergents Cleans Tank Walls And Drain Lines. Works Around The Clock In All Weather Conditions.A Complete Lineup Of Convenient Forms For Maximum Ease Of Use. 100 Percent Biodegradable Liquid And Environmentally Safe When Disposed Of Properly. Holding Tank Deodorant, contains 12 rapid-dissolve packets. 100% biodegradable. 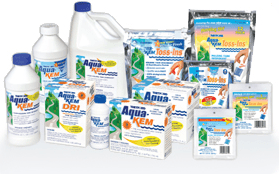 Aqua-Kem Toss-Ins is a 3-in-1 product. The powerful deodorizer controls odors, the waste digester liquifies and breaks down the solids in the holding tanks, while the detergent cleans the tank and the drain lines. Comes in our popular foil zipper pouch. The ultimate in convenience! Simply toss ‘em into the tank. These water-soluble packets dissolve fast to deliver great deodorizing power and cleaning action. Convenient, pre-measured, waterproof packs of non-dusting granules. There is nothing worse than horribly smelling holding tanks in your RV. If you can’t get it under control, then you are going to have a hard time falling in love with your RV. Luckily, Aqua-Kem can eliminate all the foul odors coming from holding tanks and keep your RV smelling fresh and clean. I highly recommend you give one of these great products a try in your own RV. You will be thankful that you did!